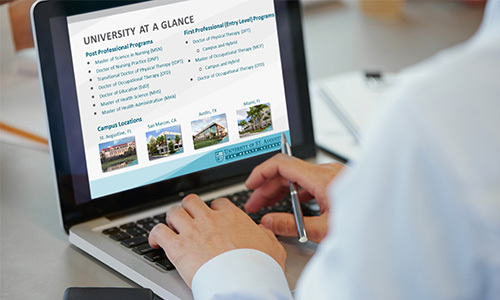 Join us online for a Virtual Information Session to learn more about the University of St. Augustine’s Doctor of Nursing Practice (DNP) program. All of our degree programs combine our professional, high-quality instruction with an interdisciplinary educational curriculum. Complete the form below to register for this or future virtual information sessions and get a jump start on your application for admissions to a USAHS graduate health science program with Informatics specialization!